Race car driving has long been a passion for men. As history tells us, competition sports has been done since time immemorial and the opportunity that these fast machines has provided to go the next step in racing has been widely embraced by both the drivers and the spectators. In the start of the 1900’s barely a decade after the First World War was finished, Italy developed its own open road endurance dubbed as the Mille Miglia, or in English the Thousand Miles. The first race was done in March of 1927 and the Italians swept the first three places. Other European nations joined the Mille Miglia and it would take 4 years before a non-Italian driver won the coveted trophy. For more than a decade, the races became the marquee for endurance races in Europe. Many European developed cars joined the races to show their supremacy in car manufacturing. Many cars though did not survive the ordeal and some racers didn’t even get to finish the race. But they were still magnificent race cars that were the epitome of sports cars then. Due to some accidents that killed their drivers, maimed their vehicles and also killed some spectators, the races were discontinued for a while. The Mille Miglia races soon were resurrected after a three year hiatus during the war era. More cars from different European countries joined but it was still the Italians who dominated the events. But the races were discontinued after ten years as more accidents happened. Today, in Italy the Mille Miglia is best remembered for the competition that took place and the prestige it gave those that came out on top. For vintage car enthusiasts though, it was the vintage race car entries that captures their fancy. Each and every Mille Miglia vintage car race entry that competed in the race were machines that were superior in that era. Each of them had a distinct advantage over the other and those were the sports cars that people coveted then. Presently though, some people still would like to get their hands on these mechanical beauties, not to race them, but to restore them and to show to others, sharing a part of a historical mark in automotive racing. Each Mille Miglia vintage car race entry was generally European automotive brands. In the first ever race; it was the Italian brand Om that took the first three spots. Other notable marques were Alfa Romeo, Ferrari, Porsche, BMW, Maserati, Moss and numerous others. Many of these brand names still exist today and are known for their super cars that exceeds the normal capabilities of other everyday vehicles. For a selected group of car buffs, it is the vintage race cars of these well-known brands that they are after. Fortunately though, there are still some of these vintage race cars that exist today. And the fact that they have joined the Mille Miglia gives them a distinct aura from the others even with the same brand, make and model. As a Mille Miglia vintage car race entry they can proudly wear this honor as a badge and this makes them more priceless. 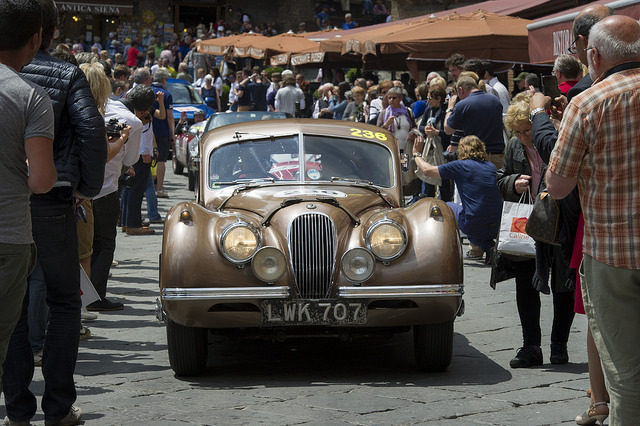 If you are in the market for a Mille Miglia vintage car race entry, scouring the internet would be your best choice. You will certainly find websites that can offer you these vintage race cars, or you may at least find information where to find them.